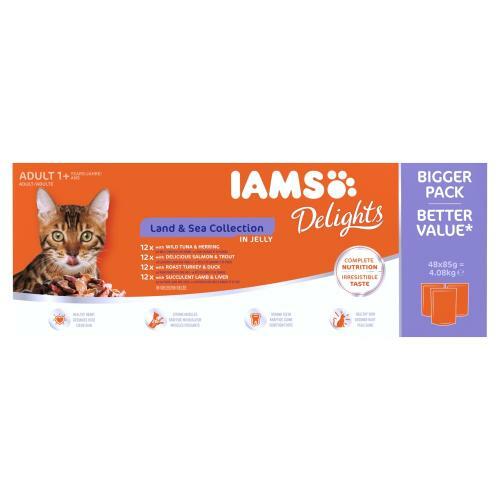 IAMS Delights Land & Sea Collection in Jelly is a complete and balanced top-quality wet food for all adult cats. Containing all your cats’ favourite, ingredients with all of the vital nutrients needed to lead an energetic and happy life. High in animal protein, it’s nutritious and palatable. He’ll love every bite! • Wild Tuna & Herring. • Roast Turkey & Duck. • Delicious Salmon & Trout. • Succulent Lamb & Liver. Protein 9.2%, Fat Content 4.8%, Crude Ash 1.4%, Crude Fibres 0.4%, Moisture 79.3%.